Fantasy sport started in the 1960s in America, but it wasn’t until the 1990s that records exist for competitions for Australian rules fantasy football. The history of fantasy AFL is littered with attempts to build Web sites and services to enable the full American experience of rotisserie leagues, where fantasy coaches engage in private drafts with a handful of friends to play against each other with distinctive teams. However, despite the obvious passion with which Australians hold their native football code, it is the British-style salary cap competitions, particularly those operated by newspapers and the Australian Football League (AFL) itself, which has attracted the vast majority of interest from the public. The pioneer was Fairfax’s Age newspaper in Melbourne, which ran a competition in its pages for three or four years during the mid-1990s. Players were given ratings of 1 to 10 and participants had to not only pore through the back half of the newspaper looking through all the players and their stats, but then could only find out how their teams went on the weekend in the paper during the following week. Team selection and trading was accomplished by cutting a form out of the newspaper and mailing it in. News Ltd’s Australian newspaper launched a competing game several years later which as far as I can tell was the first to be called Dream Team. News Ltd now owns the Dream Team trademark. The Australian’s Dream Team game eventually introduced phone-based team updating, which was originally on a free 1800 number but was then shifted to a metered 1300 line, giving News Ltd a significant extra revenue stream. The Australian Dream Team was discontinued after 2002. The first online competition I can find evidence of was the Internet Fantasy Footy League, a service offering private rotisserie-style leagues started in 1994 by a South Australian called Mark Braithwaite, better known as braithy. Registration to join the IFFL and its sister competition Goalkicking Fantasy League (GFL) cost $20, and coaches competed for small cash prizes within their leagues. Scoring was based solely on the goals and behinds each AFL player scored on the field each week. The success of IFFL, albeit on a small scale, encouraged some imitators. Simulated League Football started in 1995, using the same scoring system but adding more complexity in the management area, and has operated since then. The AFFL, where the A originally stood for Andrew’s but now stands for Adelaide, was started in 1996 by Andrew Newman, a maths student at Adelaide University and continues to this day with rules such as putting players on a “veteran” list after they have been retained by the same fantasy team for 10 years! Four such leagues came together in 1999 to form the Australian Fantasy Football Association. One of these was Robert Birks’ Fantasy Australian Rules Competition, which started in 1996 as a free service, then in 1997 required a $20 entry fee only to fold soon after. Another AFFA member was the RNAFFL (Richard’s NETional Australian Fantasy Football League), run in 1997 by Richard Scott which claimed to be the first online competition to restrict teams by player position. Between around 1997 and 2001 there doesn’t seem to have been much activity in fantasy AFL outside of the IFFL and SFL. The Australian Fantasy Footy Super Leagues site ran from 2001 to 2004. The Australian Fantasy Football League arrived in 2002 but hasn’t been seen since late 2006. 2001 also marked the entrance of VirtualSports, a business unit of VaporMedia, who have come to define the “industry”, such as it is. In their first year they ran private draft leagues called Footy Leagues, a public salary cap competition which they called Dream Team which ran for a whole year, and a third service with the same rules as Dream Team but running on a weekly basis called Round-By-Round. While the exact number of Dream Teams registered in 2001 is not known, the spread of team IDs on their pages suggests that they did not get much more than 300 teams. 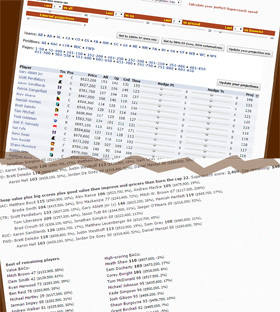 The 2001 version of the rules did not allow for any trades from the initial 30-man Dream Team squad, restricted the amount of players you could buy within certain price bands, and used a scoring system incorporating rebounds and clangers where scores were much less weighted towards raw possessions. In 2002, VirtualSports won the contract to provide the first official AFL fantasy game, which also took the Dream Team name, sponsored by Sony but operating within the exclusive Telstra Internet content deal with the AFL. Again, the rules allowed no trades after buying your initial team, although the squads were increased to 36. The scoring system was amended to the same which is used in the Dream Team competition today, and in a number of other current fantasy competitions. The Weekly Game, for which the prize was a PlayStation2 and a PS2 game, was kept separate to the season-long Dream Team competition, which had a prize of two tickets to four sporting events plus airfares and accommodation plus the inevitable PS2. The number of coaches, not readily apparent from Web archives, appears likely to have been at least 20,000 judging from team IDs, and the AFL recently claimed that there were almost 39,000 participants, although that figure is most likely an amalgam of the entries of two competitions where there was significant doubling up, and thus the real figure is probably a lot closer to 20,000. In 2003 the Dream Team competition was sponsored by Yellow Pages, a Telstra business unit, and it attracted 27,920 entries. Innovations included player positions, a mid-season draft where a small number of players could be replaced, and head-to-head private leagues using Dream Teams. First prize was scaled back to four tickets to the AFL Grand Final plus airfares and accommodation and an Xbox. 2004 saw the introduction of Kelloggs as major sponsor, and the growth of the game took off with 48,532 registrations. Much of this can be attributed to the new $10,000 cash prize, while the number of trading weeks increased to two (after rounds 7 and 15). The popularity of Dream Team skyrocketed in 2005 with 131,254 teams registered, with the major innovation being the introduction of weekly trading, albeit a maximum of two per week and 20 for the season – a restriction that has continued. The Weekly Game was also merged into the Dream Team competition. The competition has continued on since then with no appreciable tinkering with the system except a gradual inflation of first prize up to its current $50,000 under the sponsorship of Coke Zero. Registrations reach 180,902 in 2006 and 237,114 in 2007. VirtualSports, which had branched out into half a dozen other type of fantasy sports since its success with Aussie rules, also signed a deal in 2006 to launch a competition very similar to Dream Team on behalf of the Herald-Sun newspaper, marking the return of fantasy football to the pages of Australian newspapers after a break of many years. Unlike previous competitions, however, Super Coach was not run by printing huge tables of statistics in the newspaper, but run exclusively online with only peripheral involvement in the paper edition. The Super Coach competition, which only differed to Dream Team in the scoring system it used which was taken from Champion Data’s proprietary ranking points formula, quickly gained popularity with 91,619 registrations in 2006 and 152,317 in 2007. While VirtualSports was having this high-profile success, there were a number of more community-based sites which were filling in the gaps for fantasy coaches. Matthew Tobin started his private league MTFAFFL in 2002 but relaunched it as WebFooty in 2003, running until 2005. Gerard McDermott and Darren Wheatley started Footy Rocks in late 2002 with a slightly different scoring system and a more accurate positional structure starting in the 2003 season. Footy Rocks offers both a public game and private leagues. My Fantasy Footy, started by Colin Harris in 2003, continues to concentrate on private draft leagues at a cost of $20 per league with the same scoring system as Dream Team. Bomberland, the site run outside the terms of the Telstra/AFL deal by Essendon Football Club, has included its own salary cap competition since 2003 called Wizard of Windy Hill, where only Essendon players can be picked. Goal Sneak, which had started life in 2000 as an AFL stats application for PCs, transformed into a salary cap fantasy product in 2004 with its own scoring system and $1000 betting voucher as first prize. Goal Sneak also runs an identical competition called Fantasy Footy Challenge in conjunction with the forum site BigFooty and a different betting partner with a $2000 betting voucher as first prize. The commercial success of VirtualSports has not gone unnoticed by others in the football industry, and there are now other “whitelabel” options for media and sporting organisations to get their own competitions. Behind VirtualSports itself, which in addition to Dream Team and Super Coach also started a competitions for Sportal and the AFL Players Association in 2007, another new player entered the industry in 2007 in the form of Extracorp, based in North Melbourne, which had already had experience as an AFL partner through its contract for providing official footy tipping software products. Extracorp won contracts for 2007 for competitions on behalf of Optus and the Adelaide Advertiser and also runs its own salary cap competition at Dreamteam.com.au. TheBench was launched in 2007 by Panacea Technologies with a private league system but will add a salary cap game for 2008. Fox Sports runs its own in-house-developed fantasy AFL product. There are still a number of deficiencies in the online fantasy AFL experience for the fan, especially in comparison to the far more advanced NFL product offered by companies such as CBS Sportsline, ESPN and Yahoo!. In part this is due to the relative youth of the Australian industry and the lack of cutting-edge technical expertise amongst its companies. However, some fingers must also be pointed at Telstra, whose exclusive Internet content deal with the AFL stands as a roadblock to the development of innovative online products, locking in AFL partners such as official statistics provider Champion Data and preventing them from striking deals with media companies to offer such vital components as live stats for online properties. Demand for fantasy products from the Australian public continues to double every year regardless, so the impetus for the AFL to open up the industry will build and build. A note: I define fantasy football here as requiring teams made up of real AFL players where the competition involves your team scoring points from the actions of players in real AFL games. Thus management simulations with imaginary players don’t qualify. Great read ! you have done some good research there. Keep up the good work. Love the summary but I’m curious, if Champion Data aren’t allowed to provide live stats outside of AFL providers, how does FanFooty provide live scores? One big competition you’ve missed was run by TRICOM (a 13/1300/1900 etc service company). Started as a trial during the finals series of 1994 then ran for a few years after that. Was sponsored by Optus for some of the time. Weekly prizes of $2000 in 1994 (thank you very much…) The prize for 1995 was a $13,000 car (although I was able to convert that directly to cash!). Definitely one of the biggest at the time. A little bit more history to assist with a fantastic write up. Paul Johnston created the first internet fantasy football competition I came across called the ARFFL, which started in 1994, and was still runnng last time I looked several years ago. It was simple game stats league, with a limit on how many ruckmen you could have in a team but no other limits. FARC which I started in 1996 ran for several years, but after sampling Richard Scott’s positional league (RNAFFSL – although I have no recollection of it actually being called this) I converted it to a position based league and I think dropped the $20 fee, which was a nightmare to organise. In the late 90’s Drew Parker created a wonderful automated website for the scoring, as previously we had all done the scoring by hand. I’m a bit vague on the precise timing but I think FARC merged into Drew’s league, called the AFFSL. There were several (8 or more I think) leagues running at one time, and this was still running when I resigned at the end of 2003. It folded due to the costs for Andrew to keep the server running sometime shortly after that. The positional league format was fantastic, and in my opinion better than any of the other formats out there, at least for the serious players. You drafted a squad of about 40 players each (each player could be in one team only). Each player was given a positional rating, for example, I remember Brad Ottens was Ruck / Centre Half Forward. You then picked your team, with players only able to play in their designated positions. Anyway, I hope that helps with your history. I also remember an Adelaide based league called ?BFFL which is not mentioned above. A great article. The Ultimate Football Competition (UFC) which I have been the commissioner is a workplace competition which started in 1991. I suspect there are many early examples of comps which never made it to the mainstream. The competition is national because we have offices in every state. Our competition is an example of the ‘traditional’ fantasy football by using only scores (i.e goals & behinds) to recreate match-play. The other feature is the use of standard positions, FP, FF, FP, HFF, CHF, HFF etc which are still the traditional way AFL clubs name teams (positional league format). Therefore, in our comp players can only be named in positions they have been listed in the AFL. Matches are head to head and are real scores not the artificial ‘points’ created by the newer ‘stats’ based fantsay comps. It started with an eight team Div1 in 1991. We are now into the 18th year and have had up to three divisions and nearly 60 different coaches over the years. Every match is recorded, win-loss records kept, etc. Founder coaches have now racked up 321 games as of today. Anyway, I can send you more information if you are interested. I’m pretty sure this was one of the first years that virtualsports was running – does anybody else remember the idiotic rule that meant the highest scoring emergency would count? Which meant the best thing to do would be to deliberately place a zero somewhere and have two cracks at it with your emergencies. Monty, great artical, quick clarification. TheBench launched in 2005. Another Adelaide-based league with their roots in the early 90s is the EBL (Even Bigger League). It began in its current guise as The Big League with six teams in 1993, expanding to 10 (Even Bigger League) in 1994. The same 10 coaches are involved today, having rejected numerous offers to expand for sheer logistics. This may change if the AFL grows to 18 teams. The EBL uses seven catergories (kicks, mks, handballs, net frees, score, hit-outs and tackles) to decide a match. Teams are “drafted” at a pre-season auction with each club allowed to retain up to five players from their previous list. Trading is also permitted pre-season. The League includes an AFL official, an AFL club media manager and many journalists spread out across the country from Brisbane, Melbourne, Adelaide and Perth. The League also used the current AFL finals system (played in rounds 19-22) two years before it was adopted by the AFL. One such coach who was unable to attend the 1994 draft once racked up a $4000 phone bill, attempting to draft his side from South Africa. His team finished last. The league also coined the term “the Wheildon” after former Fitzroy player Doc Wheildon who was one of the first players since the league began to deliver a match consisting of no kicks, no marks, no goals, no frees for, one free against, no score, hit-outs or tackles. I remember that jjcs – though I didn’t think it was idiotic – it was handy! Plus emergencies could fill gaps from anywhere in the 22 – I used to use inconsistent but high potential players like Wayne Carey in his Crows years as an emergency and he’d cover my lack of 6 midfielders! Aah, the good old days. I also remember buying Jason Johnson for $20 (Nathan Buckley was a premium player at about $400 as I remember) prior to his first game. Now he’s retired… I feel old. Great article M0nty, But something you missed was a book. “Advantage League Football” was written by Graham ‘Smokey’ Dawson and published in 1992. This little gem was, I suspect, the first formally published dreamteam style book in Oz, and spelled out how to run such a comp in the days before the internet. I just stumbled upon this site by googling the old FARC competition that Robert Birks ran (see his excellent comments above). Great to have this piece of history online now that fantasy footy has become so huge. FARC ran for a decade (1996-2005), first under Rob’s direction and then by several of us who had been in the league for a few years. It was great fun, and as a Pom who lives in the USA I was somehow able to win 4 premierships Each year, would keep 10-15 players from the previous year under a “salary cap”, and then have a draft. There was active trading through the year. My main comment is that it’s remarkable how similar the AFL Dreamteam scoring is to that in FARC and the other leagues from around 1998. Only some very minor differences (3 pts for kick/hb, 4 pts mark…) and like Dreamteam, any player score of >100 and team score of >2000 was regarded as impressive. The positions were more sophisticated: Full Back (3/2 of raw score), Centre Half Back (4/3 of raw score), Defender, Onballer, Forward, Key Forward, Ruck and a scoring bench (2/3 of score). Anyway, I’m sure that AFL/Virtual Sports got their ideas for Dreamteam scoring via one of our early leagues. The legend of FARC still rolls on, but in a different sport … four of the old league mainstays are now in an advanced Fantasy NFL league. I remember entering the season and weekly comps in the last 10 weeks of 1992 and I clearly remember being ranked out of 29,000 in the season comp, and about 7,000 in the weekly. I thought I was a good chance to win a weekly prize, but never got it. I came 58th in the season overall in 2003.